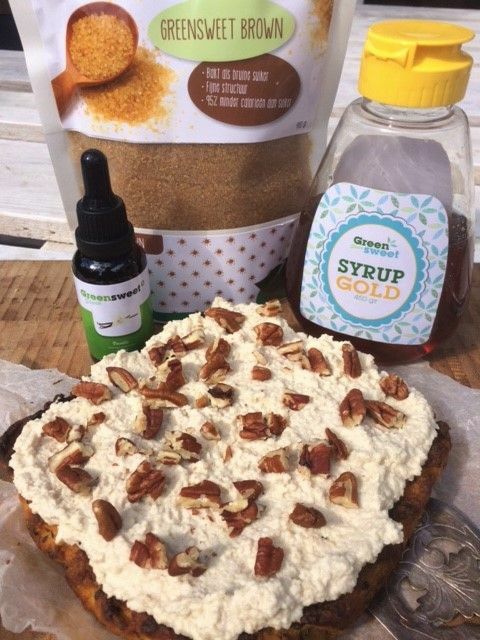 A recipe from Manon from Vegan Flavors in which she has processed Greensweet Brown and Syrup Gold. a few drops Greensweet liquid stevia Vanilla (to taste, I used 6 drops). Preheat the oven to 170 degrees. Line a tart with baking paper or grease with vegetable butter and sprinkle with some flour. Put the coconut cream together with the pumpkin puree in the food processor and switch on. If it is an even substance, turn off the food processor. Pour the puree into a large bowl and add the remaining ingredients. Mix well together. Pour the batter into the tart mold and put it in the oven for about 40-45 minutes. Meanwhile, make the frosting. Put the soaked cashew nuts in the food processor together with the vegetable milk. Turn on and when it is finely ground, it is ready. Pour the frosting into a clean bowl and add the remaining ingredients. Mix well together. Has the cake cooled down well? Then spread 2-3 el frosting on the top of the cake. If necessary, finish with some pecan or walnuts. It is best to store the cake in the fridge because of the frosting.